You order a smothered burrito, huevos rancheros, or enchilada and your server asks, “red or green sauce?” Which one is spicier? Which one do I like better? You’re blindsided for a moment while you think about what to order. Both are delicious, but you never want to have that feeling of wishing you had ordered something else. Tortilla Flats is incredibly knowledgeable about all of our fresh ingredients and will be more than happy to help you determine which is the right choice. 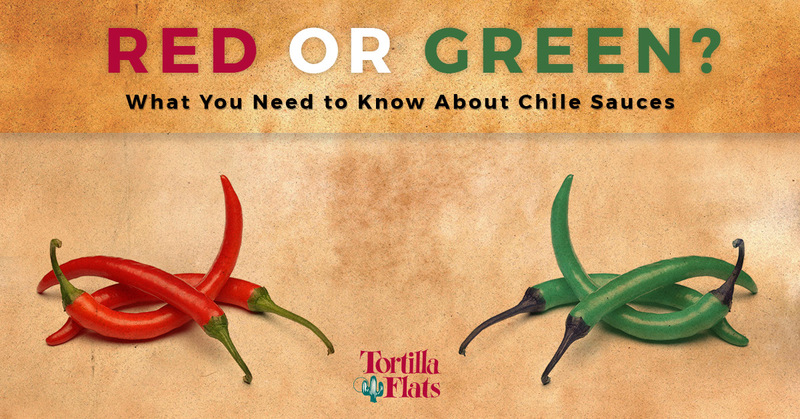 To really go in depth into this New Mexican food staple, we’ll discuss peppers, heat, cultivation, and other tidbits of information that will wet your appetite for authentic Mexican food. Mexican cuisine uses chile peppers like Americans use potatoes. They are in many classic dishes and add a well-known spice to your favorite dishes. But peppers may have been brought into the region from Spain and was not originally used in Mexican cuisine. The Southwest, north of the Mexican border, began cultivating chiles around the 1700s and it began to grow in popularity in more colonized areas. In these areas, chile peppers became more popular in order to add variety to the local, existing food, which was traditionally fairly bland. A popular variety of chile in New Mexico is similar to the Anaheim chile, which is a long and narrow green chile. Other varieties have become popular through cross-pollination such as Big Jim, Sandia, and Rio Grande. Each type of pepper has a different heat level, or Scoville unit. Big Jim’s are typically a medium heal, between 2,500 to 3,500 Scovilles. For a comparison, Sriracha is around 1,000 to 2,500 and Tobasco is around 2,500 to 5,000 Scovilles. 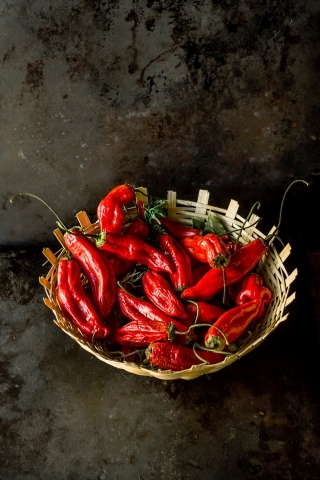 An extra hot pepper, for example, is a Diablo, which has around 5,000 to 7,000 Scovilles. The heat and the flavor of a pepper can depend on the seed, the dirt, the water, the altitude, and the climate. Red and green peppers are actually the same! Some peppers are picked green while others are left to ripen on the plant until they turn red. Many green chiles are roasted and peeled for green chile sauce, dried for green chile powder, or simply chopped. Red chiles are also picked and roasted in the same way green chiles are, or they may be strung into ristras and hung to dry. When making red chile sauce, the peppers are then rehydrated before cooking. If you’ve ever seen images from New Mexico, you’ll surely have seen groups of hanging red peppers. The difference between the two sauces is actually how it’s prepared. When making the sauces, if the seeds and the veins of the pepper are removed, the sauce won’t be as hot. A red pepper is riper than a green pepper and so it can have a sweeter taste, while a green sauce may have a more herby flavor. If you’re in the mood for some delicious and authentic New Mexican food, Tortilla Flats won’t disappoint. You still may need to ask your server which sauce is hotter and get an opinion on the flavor of each, but if you still can’t decide, order it up “Christmas style!” We’ll be happy to serve up a spoonful of both fresh and tasty sauces.